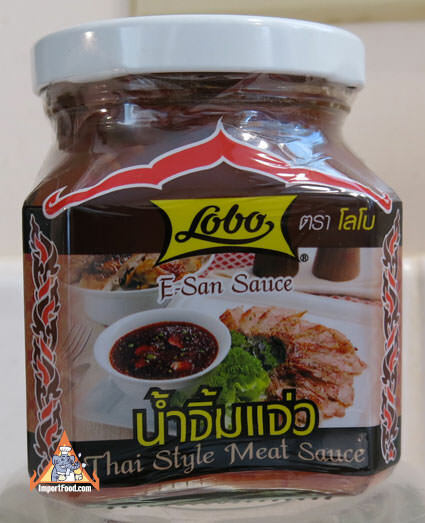 This is a new formula from Lobo, packed in a new attractive square glass bottle, what they call "E-San Sauce". All natural ingredients, poured into a dish this sauce looks very attractive and delicious. You can see a really fresh mix of red chilli, coriander leaves, onion and tamarind. Flavor is good, and not very spicy. The sauce has a nice substance, works just perfect for dipping meat and vegetables. Serve with jasmine rice or sticky rice for a nice snack or meal. If you are expecting a nice spicy heat, all you would need to do is add a sprinkle of our "Thai Crushed Chilli" which would give it a good burst of spice and keep the original authentic flavor. We really enjoyed this sauce served with Steamed Buns, Salapao. Ingredients: fish sauce, tamarind, water, palm sugar, chilli, spring onion, long coriander leaves, mint leaves, roasted glutinous rice. The version featured in our street vendor video is made with bamboo, dried shrimp and various Thai spices. The recipe below is how we prepared it, with pork. You might also like our recipe for steamed dumplings.